Falsification of theories with one theory being superseded by another—evidence falsified the Davson-Danielli model. As we saw with Watson and Crick, models play an important role in developing knowledge in biology. This is particularly important when studying microscopic structures. Davson (a physiologist) and Danielli (a chemist) proposed a model in 1935 that was based on twin layers of protein surrounding the membrane – a protein bilayer. This was based on studies dating back to the 1890s. In particular, the work of Gorter and Grendel was instrumental in establishing that the membrane consisted of a lipid bilayer. The Davson-Danielli model appeared to be confirmed by subsequent electron micrographs taken in the 1950s that showed a darker band, thought to be protein, surrounding a lighter core of phospholipids. One of the key tenets of this model was that the protein layer was embedded within the bilayer, thus preventing the phospholipids from moving around. This model was adapted by Robertson in 1959 to have the protein layer on top of, but not embedded within, the membrane. In his model, the internal layer was proposed to be composed of either polysaccharides or polypeptides. Developments in microscopy techniques, however, soon led to the revision of this theory and its replacement with the Singer-Nicholson model, which is the basis of our understanding today. They based their model on Freeze-Fracture techniques, which involved rapidly freezing cells and then fracturing them. This fracture plane is between the phospholipid bilayer. Visible in these micrographs were a series of bumps or protrusions – which turned out to be the integral proteins embedded within the membrane. The structure of the proteins themselves were also able to be studied in more detail and it was revealed that they were globular, rather than fibrous, and thus unlikely to be find in a structural role. From this developed our modern understanding of a fluid, phospholipid bilayer containing a range of peripheral and integral proteins within it. The methods of the natural sciences based on observation of the world as a means of testing hypotheses about it are designed to reduce the effects of human desires, expectations and preferences, in other words they are considered objective. (p36). In what ways does this example demonstrate this? Why is it important to understand theories that are no longer used? If our understanding of science is dependent on technology, and technology is continually advancing, will we ever arrive at a single, final understanding of the natural world? 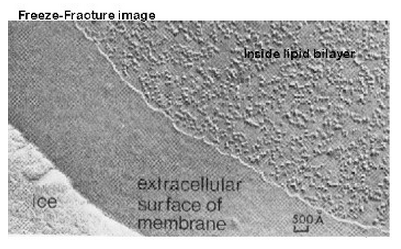 Eichman, P. “From the Lipid Bilayer to the Fluid Mosaic: A Brief History of Membrane Models.” SHiPS Resource Center || History of Biological Membranes. SHiPS Resource Centre, n.d. Web. 26 Jan. 2015. <http://www1.umn.edu/ships/9-2/membrane.htm&gt;. Danielli, J. F., and H. Davson. “A Contribution to the Theory of Permeability of Thin Films.” Journal of Cellular and Comparative Physiology 5.4 (1935): 495-508. Wiley Online. Web. <http://onlinelibrary.wiley.com/doi/10.1002/jcp.1030050409/abstract&gt;. Singer, S. J., and G. L. Nicolson. “The Fluid Mosaic Model of the Structure of Cell Membranes.” Science 175.4023 (1972): 720-31. Web. 27 Jan. 2015. <http://life.umd.edu/cbmg/Faculty/song/688D/Paperdiscussion/Singer%20and%20Nicolson%201972.pdf&gt;. Allott, Andrew, and David Mindorff. Biology: Course Companion. Oxford: Oxford UP, 2014. Print. Diploma Programme Theory of Knowledge Guide. Publication. Cardiff: IB, 2013. Print.